Provided photo Upper Valley Medical Center President Tom Parker presents the UVMC 2018 Employee of the Year, nurse Ivy Thoman. 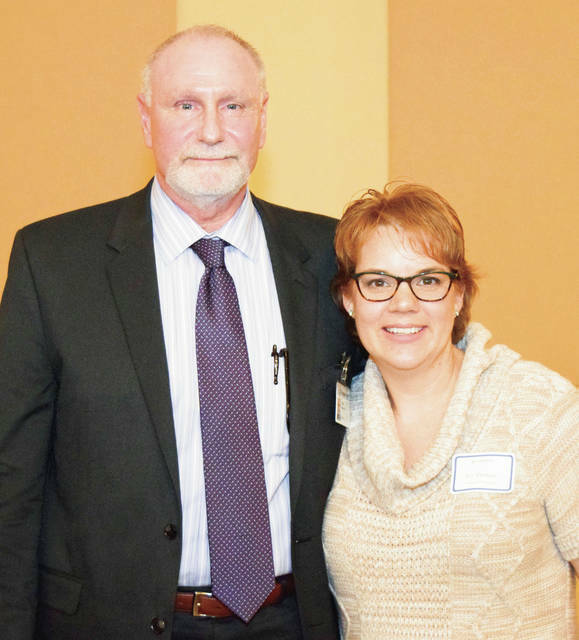 TROY — Ivy Thoman, a nurse specialist in the Emergency Department, was recognized as the 2018 Upper Valley Medical Center (UVMC) Employee of the Year during the Employee and Silver Anniversary Club banquet on Nov. 13. Tom Parker, UVMC president, announced Thoman’s selection. She has been employed by UVMC since July 2007. She was recognized by fellow employees as a positive role model and an inspiring nurse. Thoman and her husband have four children. They live in West Liberty. • 25 years: Gregory Walters, Dianne Ruhenkamp, Brenda Laughman, Amy Burt, Jenny Dietz, Lisa Emery, Roberta Ratermann, Sandra McCormick, Wayne Kauffmann, Ronald Stang and Teresa Bowers. https://www.dailycall.com/wp-content/uploads/sites/30/2018/11/web1_UVMC_2018_Employee_of_Year_Tom_Parker_with_Ivy_Tho_cmyk.jpgProvided photo Upper Valley Medical Center President Tom Parker presents the UVMC 2018 Employee of the Year, nurse Ivy Thoman.